You know what’s better than cinnamon rolls? you guess it, chocolate cinnamon rolls. 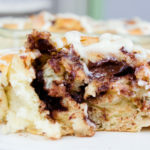 I can’t even explain how amazing warm and chocolaty cinnamon rolls right oven the oven taste! I rolled big chocolate chunks right into the rolls and the result was pieces of melted chocolate between each layer of the cinnamon rolls. In a small bowl combine yeast, 1 tablespoon warm water, and sugar. Set aside for 5 minutes. In a large bowl combine the milk, water, egg, oil, salt, and yeast mixture. Stir with whisk until everything is well combined. add the flour slowly and continue mixing until you you start to form a dough texture. If dough is very sticky, add more flour by tablespoonfuls until dough begins to form ball and pulls away from sides of bowl. Turn dough out onto lightly floured work surface. Knead until smooth and elastic, adding more flour if sticky, about 5 minutes. Rub with 1/2 teaspoon oil and cover for 45 minutes. Combine the brown sugar, cinnamon, chocolate chips, and salt. Set aside. After the dough has doubled in size punch down and Transfer to floured work surface. Roll out to 15×11-inch rectangle. Spread the butter over the dough. sprinkle the cinnamon mixture. 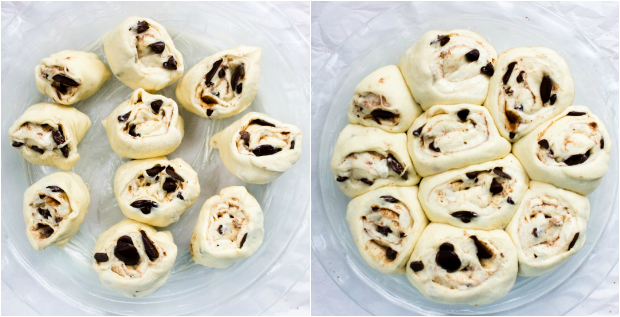 Roll the dough from the long end, be sure to roll tightly. Cut into 3/4 inch wide slices. Place rolls 1 inch apart in two greased 9x9 pans or circular pans. Set aside for 45 minutes to rise. After the rolls have risen for 30 minutes preheat oven to 375 degrees. Bake for 25 minutes in center rack. Remove and allow to cool for 10 minutes. Heat cream cheese in microwave for 15 seconds. Beat cream cheese, heavy cream, sugar, and vanilla for 3-5 minutes until you have a fluffy creamy texture. Pipe glaze mixture on the cinnamon buns or simply spoon on and spread. I can’t blame your daugther, who can resist chocolate when it’s whiting reach! 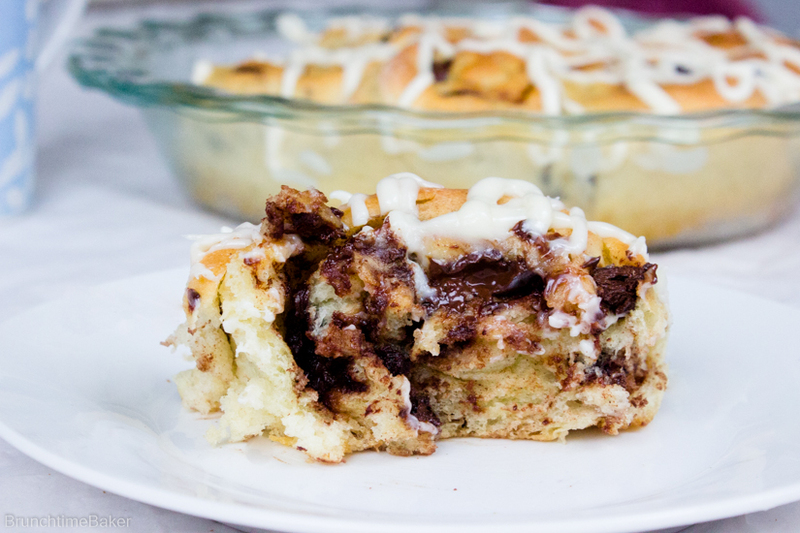 I love cinnamon buns and the addition of chocolate is just genius, they look fantastic! Your daughter sounds so adorable haha and such a cute kid! Maybe she’s on to something! I saw these floating around the inter web and I just knew they were yours! They look so delicious!! 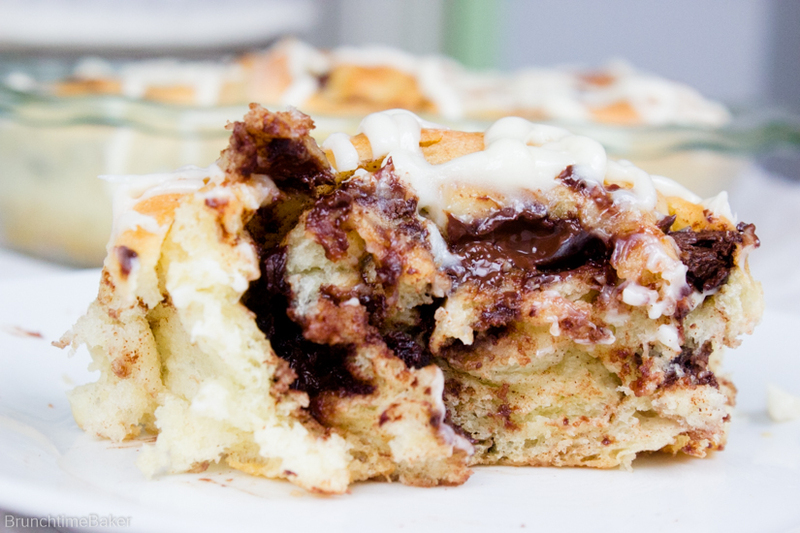 These cinnamon buns with chocolate look to die for! These look so fluffy and fab! 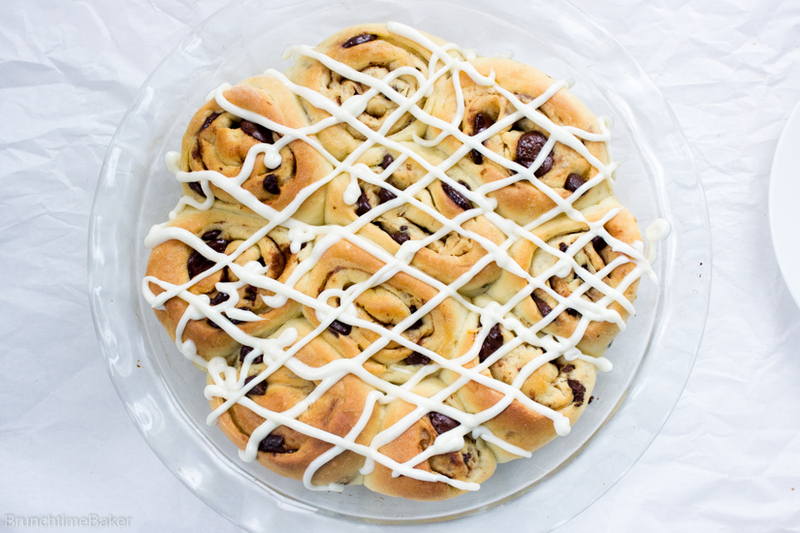 I love fun twists on classic cinnamon rolls like this. So I have a similar chocolate story…only the baby was a dog and the chocolate was a pie. Sigh. Never underestimate cute creatures! These look solo good, I absolutely need my cinnamon rolls to be stuffed and oozy gooey! Aww that’s so cute that your dogs does that. I know dogs will grab whatever they can get their paws on! Yeah it’s crazy how fast they can be. Just the other day she fell off the bed because I turned away for like 1/2 a second 🙁 Have a great weekend too Kelly! Layla, these breakfast rolls look so delicious! Love that melty chocolate in between the layers – it’s making me so hungry right now! I wish you can taste them Julia, the chocolate is just so delicious when its melted. Great photography!!! These rolls make me drool! Thank you Daniela! I’m working on the photography! I completely agree with you Stacy, I love it when she makes messes because she always looks so adorable doing it. One time I baked cupcakes and while I was photographing them I saw her hand through the lens going towards the cupcake!! If she tries to grab anything else ( which I’m sure she will) I will try to capture it! These cinnamon rolls seriously look fantastic! I can’t stop staring at them! I loooove how gooey and chocolatey these beauties are! I’m so glad you liked them Ela! I’m going to hop over to your blog right now and check out the cookies! Oh my…I’m drooling right now, and I just had breakfast! Makes my boring cinnamon raisin bagel pale in comparison. Karen, glad you liked the buns. Although now you have me in the mood for raisin bagels! You’ve got one smart girl there. 😉 Pretty sure I’d have done the same, and then proceeded to eat the whole batch of these rolls. They look AMAZING. Thank you for your sweet comment Stephanie! 🙂 your her partner in crime! Your daughter is a girl after my own heart! I have been craving cinnamon rolls for whatever reason in the last couple of months. And absolutely chocolate ones! Looks so good! Thank you so much Monica! Omgomgomg, having a miiiiinor freak out. I LOVE cinnamon rolls but have never had a chocolate variety. But, WHY NOT! These look perfect Layla…and i totally would have eaten the WHOLE bag. I like the way your daughter thinks. I’m sure your going to love them Taylor!